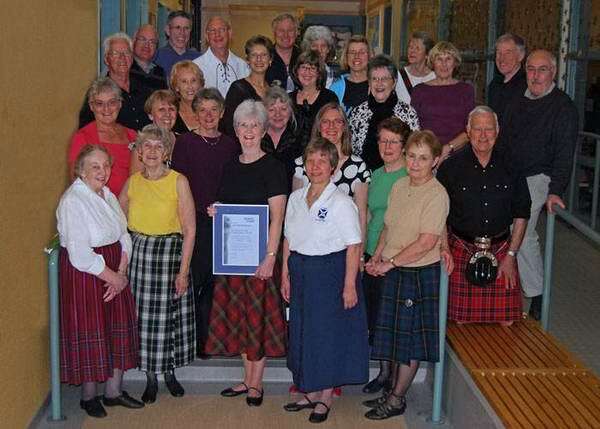 Dorothy Hargreaves received the Vancouver Branch Award on Saturday, April 10 in recognition of her more than thirty years’ association with and participation in Scottish country dancing in Vancouver. Dorothy started dancing in 1976 after having seen a performance of the Gleneagles Demonstration Team on TV. She and her husband joined a beginners class in Carisbrooke in 1976 and, five years later, she had already achieved her full Teacher’s Certificate. In the period 1979-86 she taught classes for the North Vancouver, Carisbrooke, Glenayre and the Vancouver Branch.In 1987 she started a Scottish country dance group at Deep Cove where she has been ever since, teaching an advanced class on Mondays and a beginner/intermediate class on Tuesdays. She was very active on the dance scene in the 1990s, teaching at the Sacramento Workshop (where at the after party jam session she accompanied Muriel Johnstone and Alasdair Frasier on the train whistle), the Van Isle workshop in 1997, Branch technique classes in 1997 and at the Branch 75th Anniversary Weekend in 1998. For two years she was director of the Vancouver Branch Demonstration Team and was responsible for some effective choreography. She won the 1999 competition in memory of Pearl Holmberg, a Branch benefactor, with her dance ‘A Legacy of Pearls’. This is published, along with another dance of hers ‘The Rocky Mountain Reel’ in the Vancouver Branch Ruby Anniversary Collection 1964-2004. Dorothy also has participated fully in events put on by the local Teachers’ Association of Canada and worked with the committee running the T.A.C. Summer School at the University of B.C. in 1998.